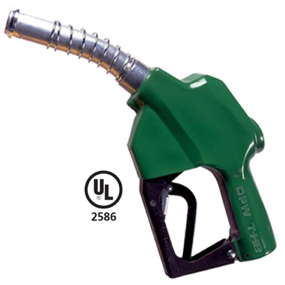 The OPW 7HB ® Series high-quality diesel automatic shut-off nozzle is designed specifically for self-service prepay or card-lock systems to help prevent diesel fuel spills. The OPW 7HB ® cannot be opened until the pumping system is pressurized, and closes automatically when the pressure is removed. This means the OPW 7HB ® is closed when placed back in the dispenser storage position. OPW 7H nozzles have a 1″ NPT inlet and a 1 3/16″ O.D. spout. Hand Insulator Color: Green.